UPDATED 12:00 a.m. ET - President Barack Obama took the stage at Tuesday’s presidential debate determined to play offense against Republican presidential nominee Mitt Romney, taking every opportunity to put his GOP challenger on the defensive, defend his four years in office, and make the case for one more term in the White House. President Barack Obama and Republican presidential candidate and former Massachusetts Gov. Mitt Romney participate in the second presidential debate at Hofstra University in Hempstead, N.Y. It was clear from the debate’s outset that it wouldn’t resemble the first encounter between the two men, a meeting where Romney was widely-acknowledged to have come out on top. After that first debate, Democrats worried that the president was not aggressive enough in responding to Romney’s attacks. But on Tuesday night, Obama eagerly went at Romney, and while the Republican presidential hopeful hardly shrunk from fighting back, he wasn't able to achieve the same unfettered advantage over the president (and the moderator) that he had in Denver. 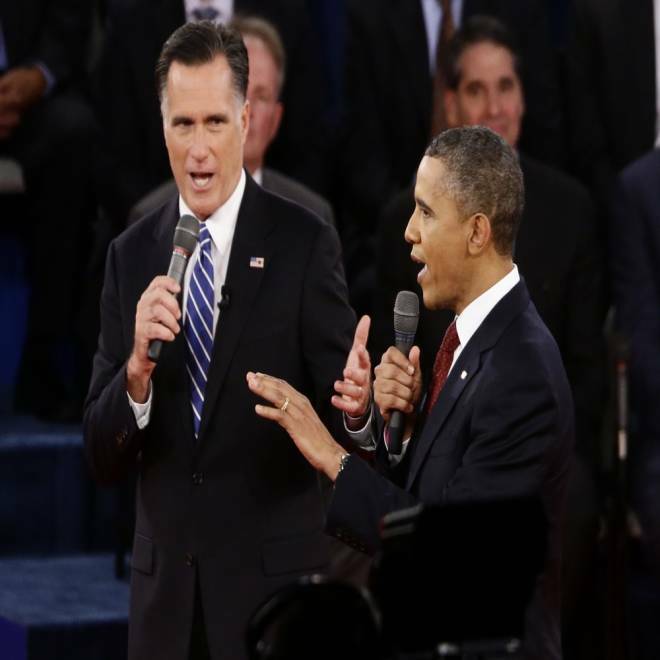 President Barack Obama and Republican candidate Mitt Romney spar on the issues in the second presidential debate. Obama and Romney battled each other early, often, and on a broad array of topics. The president sought to hold his rival to the conservative vows he had taken as a candidate for the Republican nomination, and Romney accused the president of failing to live up to the promises – on issues like employment and immigration – that he had made in 2008. Obama didn’t shy from deploying some of his campaign’s more effective attacks on Romney, related to the Republican nominee’s private sector career and immense personal wealth. "No, I haven't looked at my pension,” he said in one exchange with Romney, “It's not as big as yours, so it doesn't take that long." And the president saved one of his most potent attacks - based on Romney’s surreptitiously-recorded comments dismissing the votes of “47 percent” of Americans, whom the Republican candidate said were “dependent” on government - for the end of the quarrelsome meeting. VOTE: Did the second presidential debate do anything to influence who you will support in the election? "I believe Gov. Romney is a good man ... But I also believe that when he said behind closed doors that 47 percent of the country considered themselves victims who refuse personal responsibility, think about who he was talking about,” Obama said. The debate’s town hall-format featured the two candidates answering questions from undecided voters selected by the Gallup polling organization to participate in the event at Hofstra University. But both Obama and Romney frequently veered away from the questions themselves, turning them into opportunities to engage one another. Both men took turns standing and pacing across the stage, and they both often tried to speak past moderator Candy Crowley, despite her objections. The president pledges he will get to the bottom of the events that led to the death of a U.S. ambassador in Libya and calls Romney's criticisms of his actions following the attack "offensive." One of the most pointed exchanges involved a topic left untouched in the first Obama-Romney meeting: Libya, and the administration’s shifting explanation for an attack last month on a diplomatic post in Benghazi, which resulted in the death of four Americans, including a U.S. ambassador. "It was a terrorist attack and it took a long time for that to be told to the American people. Whether there was some misleading, or instead whether we just didn't know what happened, you have to ask yourself why didn't we know five days later when the ambassador to the United Nations went on TV to say that this was a demonstration. How could we have not known?" Romney asked. At this, Obama seemed to flash anger, turning to stare down Romney across the stage. "While we were still dealing with our diplomats being threatened, Gov. 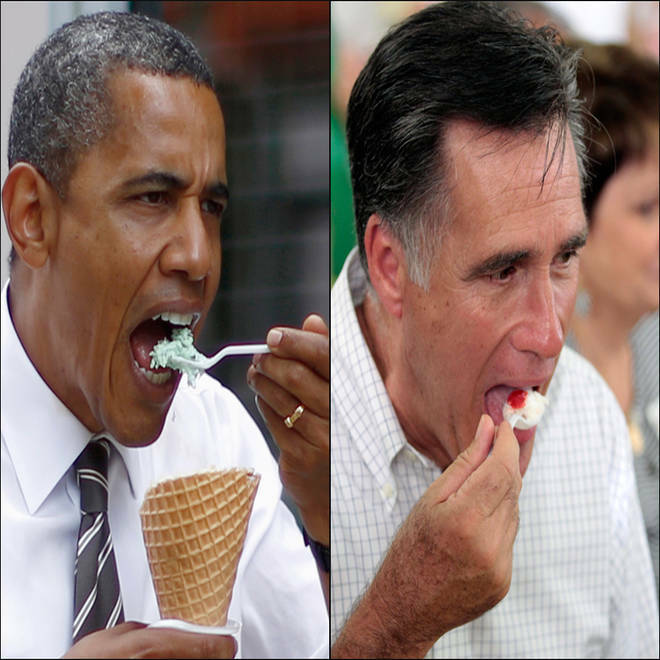 Romney put out a press release, trying to make political points," Obama said. "And that's not how a commander in chief operates." The exchange on Libya took a different turn, too, as Crowley disputed Romney’s assertion that Obama had failed to label the attack in Libya as an act of terror. Crowley’s insistence that Obama had done so drew applause from the audience – in violation of debate rules. GOP nominee Mitt Romney makes sure he gets to make his point even as debate moderator tries to move on. For his part, Romney renewed his effort to dress his policies with a more centrist tone, emphasizing, for instance, his vow to reform immigration during his first year as president or his promise to not reduce the tax burden on the wealthiest of Americans. “Why am I lowering taxes on the middle-class? Because under the last four years, they've been buried,” Romney said, alluding to a comment made recently by Vice President Joe Biden saying the middle class had been “buried” over the last four years. Romney also relished the opportunity to distinguish himself from President George W. Bush, the still-unpopular former Republican president to whom the Obama campaign often links Romney. "I'll crack down on China, President Bush didn't," Romney said in recitation of the instances in which he breaks from the last Republican president. "I'm going to get us to a balanced budget. President Bush didn't." Romney also had a crisp response prepared to Obama’s argument that Romney would have allowed the American auto industry to fail amid its 2008-2009 crisis. The Obama campaign has used Romney’s 2008 op-ed for The New York Times – “Let Detroit Go Bankrupt” – to pummel the Republican throughout the industrial Midwest, where much of the election has played out. NBC News analysis: Mitt Romney takes a limited view on oil and gas production on federal lands while Barack Obama is mistaken about Romney's stance on Detroit auto makers. NBC's Andrea Mitchell reports. "The president took Detroit bankrupt. You took General Motors bankrupt. You took Chrysler bankrupt. So when you say that I wanted to take the auto industry bankrupt, you actually did," Romney charged. "And I think it's important to know that that was a process that was necessary to get those companies back on their feet, so they could start hiring more people. That was precisely what I recommended and ultimately what happened." But Obama had also done his homework before this debate, and he was quick to remind voters of what Romney had promised during his march to the Republican nomination – from his vow to eliminate federal funding for Planned Parenthood to his opposition to an immigration reform package, the DREAM Act, to taxes. President Barack Obama attacks former Gov. Mitt Romney's tax-cut proposals in the second presidential debate of 2012. "When Gov. Romney stands here, after a year of campaigning, when during a Republican primary he stood on stage and said 'I'm going to give tax cuts' - he didn't say tax rate cuts, he said 'tax cuts to everybody,' including the top 1 percent, you should believe him because that's been his history," Obama said. Whether Obama’s more lively debate performance would be enough to stanch the Democratic hand-wringing and Romney surge associated with the first debate was less abundantly clear. Tuesday’s debate took place just three weeks before the election, and Romney has shown signs of growing competitiveness versus Obama in polls of swing states and national polls. The candidates will go at it again on Monday in their final of three scheduled debates this fall, a foreign policy-focused debate held in Florida.